It’s Yoda’s turn to get broken down via a Fun Facts video from Star Wars Kids. In it, you’ll learn, or more than likely, your kid or non-Star Wars fan will learn, more about the tiny green Grand Master of the Jedi thanks to a series of animated segments and data points that get displayed throughout the video. 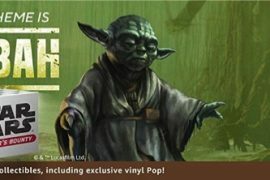 Even if you know all that you think there is to know about Yoda, you should still check it out above. There’s also another Yoda video to check out this week, and it follows the video release cadence that Star Wars Kids has been rolling with lately in which the Fun Fact character also gets a silly video that counts how many times they do something. This week’s for example features all of Yoda’s noises, so if that interests you, head on down below to check it out.